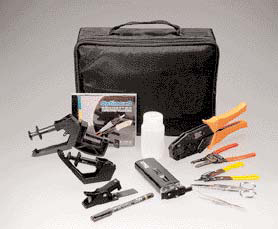 The OPTIMAX installation kit is an inexpensive, self-contained set of tools including all that is needed to successfully terminate jacketed and tight-buffered 900um fiber using OPTIMAX SC, ST and LC compatible connectors. It includes a unique microscope fitted with a handy fiber holder which greatly simplifies fiber cleave inspection. The compact, rugged nylon carrying case also includes complete installation instructions, a training video, and ‘quick reference cards’ with visual aids.